BoxOffice adds four new films to our Long Range Forecast this week: Heaven Is For Real, Transcendence, A Haunted House 2 and Bears. Will they help April post healthy numbers or are they doomed to lack momentum due to the oncoming Summer season? - The fact that it's based on a best-selling book helps quite a bit. - Sony successfully turned Courageous--another film aimed at religious crowds--into a $35 million sleeper hit back in 2011, so they clearly know how to handle this kind of material. - We're concerned that the one-two punch of Son of God in February and Noah in March will steal away the attention of religious moviegoers and leave little behind for Heaven is for Real. - Star Greg Kinnear is far from a reliable draw. - Some families may opt to see Bears instead. - The first trailer is helping build buzz at a steady pace on Facebook and Twitter. 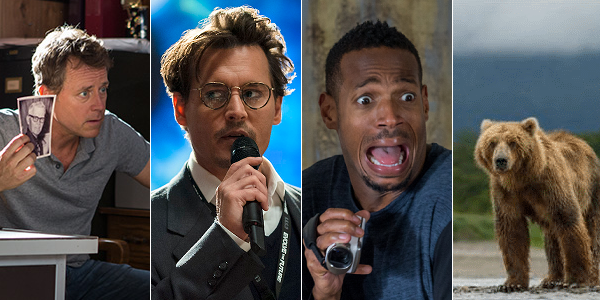 - Transcendence boasts one of the most impressive ensemble casts of the year. - We're betting that first-time director Wally Pfister has learned more than a few tricks from Christopher Nolan after serving as cinematographer on many of his films. - Star Johnny Depp is on a cold streak following Dark Shadows and The Lone Ranger. - It's possible that males 18-34--a big demo for this one--may just save their money until The Amazing Spider-Man 2 kicks off the summer season a few weeks later. - The sci-fi genre is general is not very reliable. - The original's $40 million haul came as something of a surprise. It's clear that Marlan Wayans still has a loyal fanbase. - Early to mid-April doesn't boast a lot of comedies, so competition in that area will be thin. - The underwhelming performance of Scary Movie 5 last April is reason for concern. The horror-spoof genre could be running out of steam yet again. - The film's marketing campaign makes A Haunted House 2 feel way too much like its predecessor. Redundancy isn't always a good thing. - This one will be an easy choice for families with young children. - 2012's Chimpanzee turned into a solid $28 million hit. It's possible that the Disneynature brand is growing. - There are a lot of films aimed at families during the first four months of 2014, which means that Bears could hit a wall. Check out our predictions for these films as well as others in the table below. Notable changes include Non-Stop (up), Son of God (up) and 300: Rise of an Empire (up). Transcendence Apr 17, 2014 Warner Bros.
300: Rise of an Empire Mar 7, 2014 Warner Bros.
Phil Contrino, Daniel Garris and Shawn Robbins contributed to this report.